Russian state media watchdog Roscomnadzor has issued the first official warning to a news site that has published several cartoons on religious topics. The “Respublika” informational and analytical portal has featured several cartoons targeting a particular religious faith, the agency’s spokesman Vadim Ampelonskiy was quoted as saying by TASS. “From the point of view of the Law on Countering the Extremist Activities such actions must be considered instigation of racial, ethnic, social or religious hatred,” the official stated. Respublika is based in Moscow but mostly concentrates on events in Kazakhstan and Central Asia. 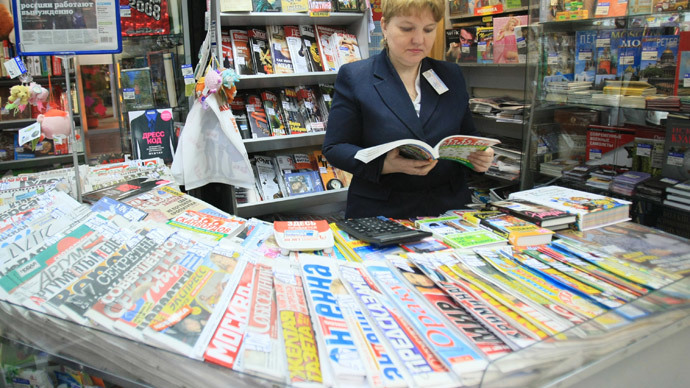 According to Russian laws, an officially registered mass media organization can receive up to two warnings from the state in one year – more violations would lead to the outlet losing its mass media license. Ampelonskiy also said that Roskomnadzor considered Respublika’s actions a deliberate provocation. Last week, Roskomnadzor issued an official explanation to Russian journalists telling them that releasing any cartoons on religious topics could be considered a violation of the law. The document was posted on the agency’s website and forwarded to all registered mass media, according to the spokesman. The notice also stated that the official position on the issue had been formed some time ago and its implementation had been approved by the journalistic community and law experts. Warnings and bans over religious cartoons were issued as far back as 2006 and 2008. However, Respublika’s senior editor and founder Irina Petrushova wrote in Facebook comments over the incident that her company hadn’t received any explanations or letters from Roskomnadzor, and that no official documents concerning cartoons could be found on the agency’s website. On Friday last week, the head of the Russian Council of Muftis, Ravil Gainutdin, addressed the country’s prosecutor general with a request to launch a major probe into mass media and internet sites “in order to disclose any reports or pictures that blacken the image of the Prophet and insult the feelings of believers.” There has been no official reply to the mufti’s request. On Monday, the head of the Chechen Republic, Ramzan Kadyrov, personally led a rally in the region’s capital Grozny, protesting against insulting Islam and the Prophet Mohammed, in particular by the Charlie Hebdo magazine in France. According to local police, more than 1 million people attended the Grozny meeting.